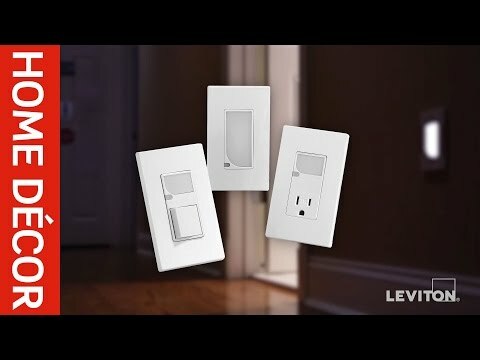 Leviton Decora Plus™ 2-Pole 3-Wire Straight blade receptacle in gray color, has voltage rating of 125-Volts and current rating of 20-Amps. It withstands dielectric voltage rating of 2000-Volts. 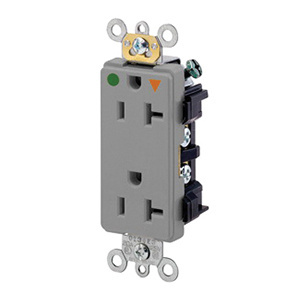 With back and side wired termination, this receptacle accommodates 14 - 10-AWG conductors. This isolated ground receptacle has brass-hot, green-ground and silver-neutral color-coded terminals for easy user identification. It features nylon face and body. This duplex receptacle comes in NEMA 5-20R configuration. It measures 1.52-Inch x 1.14-Inch x 4.06-Inch. It has maximum load capacity of 1 hp. Hospital-grade receptacle features steel strap for superior assembly security. The zinc-plated steel clamp nuts keep water and dust from getting into the body of the receptacle. It has brass 10-32 terminal screw that allows for easy external wire management. The brass screw ensures better grounding of the receptacle. It withstands temperature range of -40 to 60 deg C. This receptacle has flammability rating of V2 per UL94 to withstand harsh environmental conditions. Receptacle is UL listed, CSA/NOM certified and meets NEMA WD-6, ANSI C-73 standards.